Gosh I'm busy, thank goodness I don't work full-time! It's May tomorrow (I can't bear it, the year is going so fast), which means LOAD514 begins! This will be my first ever LOAD and I really want to join in on all the fun, which means I am going to try and make a layout each day, for the whole month of May! This is going to be some challenge, it usually takes me the whole month to make one layout, which is actually created for inspirational purposes for the lovely ladies who attend my Crop! So, to try and make 31 layouts in a month, well, it's going to be a little tough, but a challenge, something to work towards is a good thing, right? We'll see! On top of LOAD514, I will be starting the latest Online card class on Monday, which you will already know about if you are following me on my little crafting journey here! I heat embossed, with clear embossing powder, the floral image, which came from the Morning Meadow Stampin' Up stamp set and made a wash from Stampin' Up inks which I "washed" over the area. I love this resist technique and even though I have perhaps overdone it a bit with the wash, I'm still pleased with how the card turned out. Thanks for popping by, have a great crafty day. I'm back with another pre-class card, practicing for the upcoming "Watercolor for Card Makers" class. I watched this great video presented by the lovely Julie Ebersole last night and thought I'd CASE her style. I used Hot Pressed Aquafine smooth watercolour paper by Daler Rowney. Someone mentioned in the pre-class discussion that Hot Pressed watercolour paper didn't warp and they were right! I love it and am a complete convert! The stamps I used are from Stampin' Up - they came from these sets "Queue Up", "Sweet Essentials" and "Gorgeous Grunge". I used Stampin' Up ink for my watercolour, the colours used were Pistachio Pudding, So Saffron and Pretty in Pink. I'm so happy, I've signed up for this class which starts on 5th May. They opened up the classroom yesterday giving us lots of details and information, so that we are ready to go on the day! I love that, I like a little prep time ;)! To get us all started they suggested we go and check out our water colour supplies. I searched and searched for a set of Hero Arts Water colours that I, like Jennifer McGuire bought about 10 years ago. Could I find them? No, I couldn't, but I did find all my old water colour stamps from Art Impressions. I thought as I found them, what cards would I make with them, if I used them now, with the other supplies I own? I combined my old Art Impression stamps with my new Stampin' Up stash! I used Stampin' Up markers, mostly the current In-Color set, along with Stampin' Up water colour paper, Naturals Ivory and Crisp Cantaloupe card stock. The shape is cut from the Stampin' Up Framelits - LabelsCollection (125598) and I couldn't resist using the matching Stampin' Up Paper-Piercing template to prick all those little holes. Of course, as usual, using my Crafty Envelope Punch Board Calculator, I made a perfect envelope, which I pricked and stamped on too! Here is a picture of the card and envelope together. I hope you consider joining the class, I can thoroughly recommend all the On-line Card Classes, I just love 'em! Have a great day and please leave me a comment if you like what you see. Having my Crafty Envelope Punch Board and calculator is really helping me to use up lots of Stampin' Up paper stacks, I seem to have accumilated so many! I have been cutting out sticky backed label paper, using my Stampin' Up Ovals Collection Framelits, for a white space where I can write names and addresses, but today to make the envelope a little extra special, I stamped the tulip image from the Backyard Baiscs set onto a scrap of the label paper, coloured it and cut it out using the Backyard Basics Framelits set of dies. I'm back today with a card I've made for a young guy, who is reaching the grand old age of 21. My Stampin' Up upline made a wonderful set of cards using this stamp set. As soon as I saw her set, I knew I had to have it and thank goodness, is all I can say! I started off with the scrap of Stampin' Up Naturals White card stock and went from there! 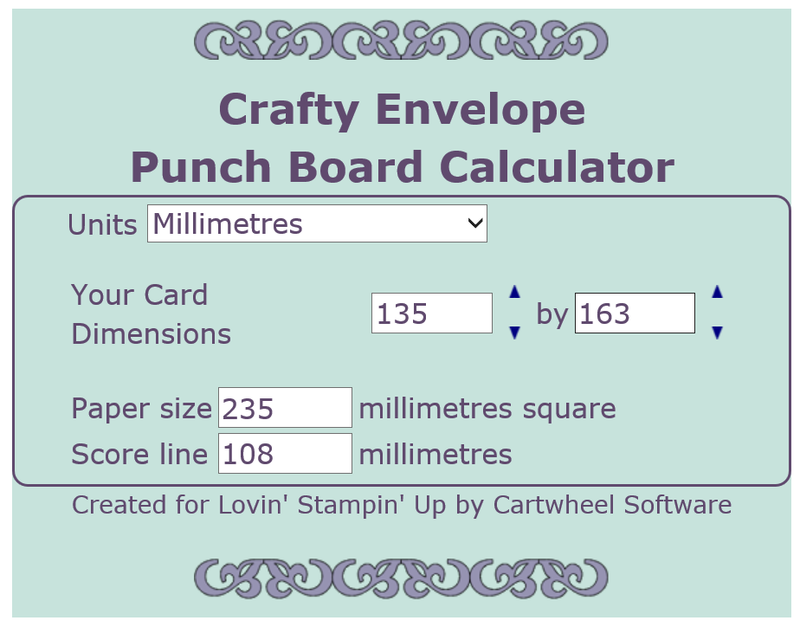 I am still feeling extremely lucky to be able to make any size of card because of my Crafty Envelope Board Calculator....here is my card with it's perfectly fitting envelope! I felt inspired to decorate the envelope as I used ordinary copy paper to make it, so the addition of the stamp and embossed road lines, makes it just a little bit more special. If you would like to purchase the Rev Up the Fun stamp set or the Envelope Punch Board, it's easy, all you need to do is click on the picture of the current Stampin' Up catalogue on the right and it will wizz you to my on-line store. Envelope Punch Board Calculator & Crafty Gifts! I've had a busy few days, my gorgeous friend Keren Baker was heading down south from Liverpool to do some video filming for Docrafts during the week. As my home is just two minutes off the route, it was a very sensible resting point for her. We did have some fun catching up, eating and creating! Don't you just love paper crafting guests? She came laden with lovely stash for me, along with choccies and flowers (I told her she shouldn't have!). ..... it would have been rude not to use it :)! Stamps, blossoms and dies all calling me to create, made by Docrafts, which is a UK based company and one, I had seen often, but actually overlooked. Big mistake, their products are amazing quality, as good as any of the top makes, in opinion and the design team have lots of inspiration on line too, giving us a bit of a lift up/starting point ;)! The bloom and the stamping were from the Docrafts stash, all the other products, are from Stampin' Up. To make this card I started with the Stampin' Up DSP, which was a scrap in my box, all the other bits came together easily. Now that I can make any card, any size, because of my Crafty Envelope Punch Board Calculator, I don't have the worry about which envelope size the finished card will go in! I took the inspiration from Jennifer McGuire's video on making boxes, with the Envelope Punch Board, to tie the envelope with a ribbon, as a closure. Thank you Jennifer for the inspiration on that one! Thanks for popping by and don't feel shy, please comment if you like what I've made. Stampin' Up Envelope Punch Board - any size! I'm back after a little break ;)! The great news is that I'm back with Stampin' Up too! I love their products and I was running out of all my card stock and wanted all the new stuff........so I'm back! You can shop on-line with me too, just click on the catalogue in my side bar and it will take you to my on-line Stampin' Up shop! All the current catalogues are there, just click and look ;)! So the other great news is that David (DH) has made us all some great software......for the Envelope Punch Board....it's the best out there......we did a little trial earlier and it nearly went "Global" before we were ready, thanks to my mate ;), she knows who she is ;)! It came up with the measurements and score line in a flash! So give it a try, you just need to click here or on my special tab at the top and it will wizz you over!